FILE - Chinese ship and helicopter are seen during a search and rescue exercise near Qilian Yu subgroup in the Paracel Islands, which is known in China as Xisha Islands, South China Sea, July 14, 2016. Nearly a week after losing a historic case over its territorial claims in the South China Sea, China is closing off part of the region for military drills this week. Beijing's maritime administration issued a warning Monday that an area located southeast of the island province of Hainan would be off limits between Tuesday and Thursday. The United Nations' Permanent Court of Arbitration in The Hague dismissed Beijing's claim of virtual sovereignty over the nearly 3.5 million-square-kilometer South China Sea in a ruling last Tuesday. The decision was a response to a complaint filed by the Philippines in 2013 over China's aggressive actions on the Scarborough Shoal, a reef located about 225 kilometers off the Philippine coast. The Hague-based court ruled that China's claims under the so-called "nine-dash line" violates the U.N. Convention on the Law of the Sea, which sets a country's maritime boundaries 22 kilometers from its coast, and control over economic activities up to 370 kilometers from its coast. 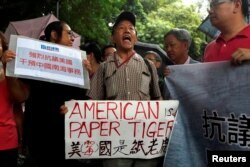 A protester from a local pro-China party chants slogans against the United States supporting an international court ruling that denied China's claims to the South China Sea, outside U.S. Consulate in Hong Kong, China July 14, 2016. Beijing refused to participate in the case, saying the court had no jurisdiction to decide the matter -- despite being a signatory to UNCLOS -- and has repeatedly denounced the verdict.